Where is an auto service center near me? What types of auto service does LaGrange Toyota provide? Our Service Center offers a full range of basic maintenance services, like oil and filter changes, tire rotations, tuneups, alignments, and fluid flushes. Our technicians are also able to perform and complete larger, more complicated repairs, like engine rebuilds, muffler and exhaust system work, and brake repairs. Our center is equipped with state-of-the-art equipment and a diverse selection of genuine Toyota-approved parts and accessories for the highest quality and most effective service. Can I schedule service appointments online with LaGrange Toyota? Yes, customers can schedule service with our virtual scheduling form. Does LaGrange Toyota have service specials? Yes, our selection of Service Specials is regularly updated and accessible online. Our incentives range from complimentary services, like car washes and vehicle inspections, as well as discounts on standard maintenance services. 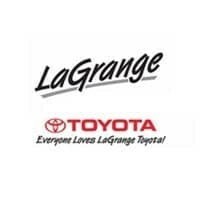 What kind of parts does LaGrange Toyota carry? The LaGrange Toyota Parts Center is home to a diverse selection of Genuine Toyota Parts and accessories. We offer exterior add-ons, items to maintain the comfort and appearance of your vehicle’s cabin, and electronic compatibility accessories. Like your Toyota, every part in our inventory has undergone rigorous standards testing to ensure its performance and quality. Customers can explore parts in-person or online, and we’re happy to order additional or out-of-stock parts for you. While shopping, we invite customers to explore our menu of available Parts Specials. When is LaGrange Toyota’s Service Center open? The LaGrange Toyota Service Center is open Monday through Saturday. It is open from 7:30am to 5:30pm Monday through Friday and from 7:30am to 2:30pm on Saturdays.